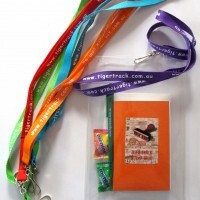 The special Tiger Track booklets are available. I have packaged them in an A5 plastic pouch on a colourful Tiger Track lanyard. The pouches hold the booklet, a pen, a postcard and two emergency Mentos! Also have a look at the terrific web site The Cheapskates’ Guide to Touring Tasmania by Car. You’ll find lots of useful information as well as a Tiger Track page. Tiger Track Magnets Fridge magnets are available depicting all the stamp designs. They are available as single magnets or in a variety gift pack of 5. This is a perfect gift to take overseas! Tiger Track t- shirts T-shirts are available in children and adult sizes. Pure cotton, black Tiger Track design on white t-shirt. Tiger track bags Good quality strong bags with a Tiger track design on one side.